Renting a basic cello costs $56.16 per month. This includes the $10.00 fee for our protection plan and a $7.00 administrative fee. The initial charge is for the first 3 months ($168.48) and after that you’ll be billed monthly. We also require a deposit of $200, which will be returned when you decide to terminate your rental or buy your instrument, as long as your instrument is not damaged. So, to begin your rental you will be charged $368.48 and your next billing date will be three months later, followed by monthly charges. 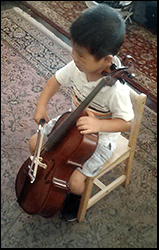 Renting an advanced cello costs $93.31 per month. This includes the $18.00 fee for our protection plan and a $11.40 administrative fee. The initial charge will be for the first three months ($279.93) and after that you will be billed monthly. We also require a deposit of $250, which will be returned when you decide to terminate your rental or buy your instrument, as long as your instrument is not damaged. So, to begin your rental you will be charged $529.93 and your next billing date will be three months later, followed by monthly charges.